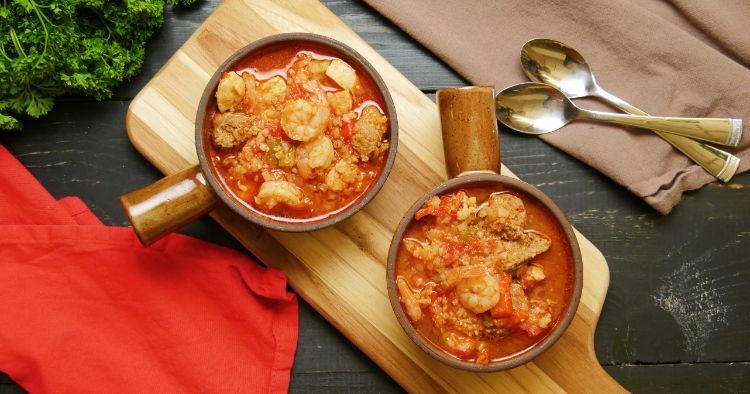 Jambalaya is a classic dish in the Creole and Cajun cuisines of Louisiana. It’s a super tasty and filling one-pot, rice-based dish that draws on influences from the cuisines of Africa, France, and Spain. Its classic flavors come from spicy pork sausage (usually andouille), the “holy trinity” of the cuisine (diced onions, celery, and bell pepper), and a Creole seasoning mixture that includes cayenne, garlic powder, sage, and other spices. The recipe below substitutes riced cauliflower for the rice, making it low carb without sacrificing any of its delicious appeal. By cooking this dish in the Instant Pot, you can have it on the table in about 40 minutes. You can’t beat that for a satisfying and flavorful weeknight meal. You can make it as spicy or mild as you like by substituting a milder sausage or adjusting the amount of the Creole seasoning you use, making it wonderfully family friendly. Laissez les bon temps roulez! 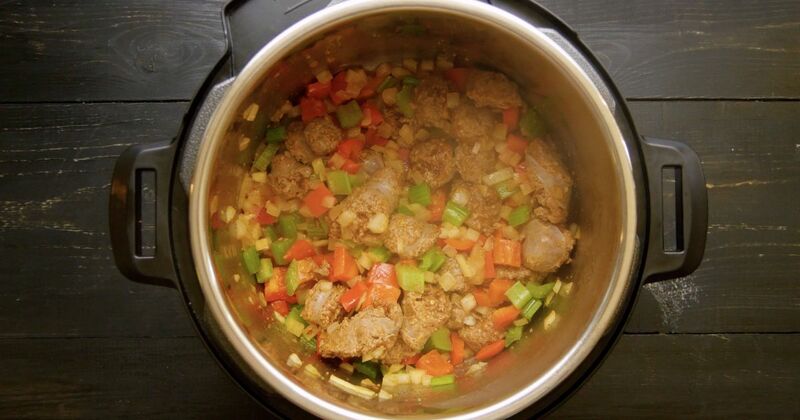 Add the sausage, onion, bell pepper, garlic, celery, and chicken to the pot and cook, stirring frequently, until the sausage is browned and the vegetables have softened, for about 8 minutes. Add the diced tomatoes, along with their juice, broth, Creole seasoning, hot sauce, and salt. Stir to mix. Close the lid of the pot and turn the valve to the sealing position. Choose high pressure and set the timer for 2 minutes. When the cooking time is up, let the pressure release naturally for 10 minutes and then quick release any remaining pressure. Turn the pot off. Turn the sauté function on and add the shrimp and riced cauliflower. Cook, while stirring occasionally, until the shrimp is cooked through and the cauliflower is tender, for about 5 minutes.